An RTG RM 20 pile driving rig hammers battered piles in the shadows of a Pennsylvania Turnpike bridge abutment on a narrow strip of land between an embankment and a roadway on a warm October morning in 2016. Upon driving an H-pile to refusal, the operator deftly executes a 180-degree turn within a confined space and crawls a short distance to retrieve the next H-pile. A worker from PKF-Mark III hooks it up, the rig lures and secures it, and then travels back to the work site. The mechanical process repeats itself over and over, indicating that serious productivity is afoot. The RM 20, preceded by the RG 19 T on the PA Turnpike/I-95 Interchange Project, represents the willingness of a forward-thinking contractor to break with tradition to install bridge foundations. PKF historically relied on a crane-suspended pile hammer. Its decision to rent pile driving rigs from Equipment Corporation of America (ECA) is paying off with doubled productivity, reduced labor, increased safety, and cost-savings. Interstate 95 from Maine to Florida was completed in 1969 with no connection to the Pennsylvania Turnpike. Since that time, motorists have been forced to navigate crowded backroads to transfer between highways. The PA Turnpike/I-95 Interchange Project — jointly owned by the Pennsylvania Turnpike Commission, Pennsylvania Department of Transportation (PennDOT), and Federal Highway Administration (FHWA) — will create the missing link. Newtown, Pa.-based PKF has been plowing through Section D10 since being awarded the $142.9-million contract in August 2014. The firm is working aggressively to finish construction by October 2017. The contractor’s scope includes reconstructing and widening 2.5 miles of the Turnpike in Bucks County; building piers for the 14-span I-95 flyover ramp; replacing three mainline bridges; constructing a four-span bridge; and repairing two bridges. Piling superintendent Sabrina Villanti sits in a job trailer rattling off details on bridges as if she keeps a set of plans in her head. “All of our piling is in the main five bridges on this contract,” she says over the muffled pounding of the RM 20 just outside. This contract consists of several foundation elements, including 60,000 linear feet of H-piles, roughly 31,000 square feet of soil nail wall earth support, 16,000 square feet of steel sheet pile earth support, and 6,000 linear feet of drilled shafts. PKF has relied on a crane-suspended vibratory hammer with leaders since being founded in 1969. 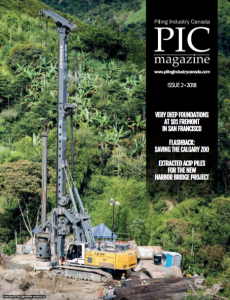 Breaking with tradition on a megaproject by switching to a pile driving rig might seem risky, but PKF planned it carefully. Keough clearly recalls the events leading up to the decision. The schedule dictated that PKF would need to run three pile driving operations concurrently. At the time, it was running two crawler cranes with vibratory hammers and the RG 19 T with a vibratory hammer. PKF considered renting a third crane and even purchased a second hammer. PKF’s interest in the RM 20 had been piqued in winter 2015 during a demonstration at ECA’s Aldan, Pa. location. Although there was no need on the PA Turnpike/I-95 Interchange Project at the time, PKF was impressed. ECA’s New York/New Jersey regional sales manager Bruce Langan arranged for the contractor to test the RM 20 on another project. The RM 20 took centre stage in August 2016. PKF’s decision to scratch the itch and try out ECA’s RM 20 paid off. Its ability to double production allowed the contractor to eliminate the third set-up altogether. The contractor further capitalized by putting the unused second crane to work with a crew of carpenters. The RM 20 also reduced manpower. The traditional set-up requires a crane operator supported by a full crew of pile drivers whereas the RM 20 requires an operator and a two-person crew. The crew has adapted well with the RM 20 as the centerpiece of the pile driving operation. PKF has two operators, neither of which are piling rig operators. The primary operator boarded his first RTG Pile Driving Rig in Summer 2015. ECA dispatched Langan and an ECA factory-trained service technician to the site at the outset to train the crew on the RM 20 set the pace for a smooth transition. Keough says there was no question they were crushing labour production numbers, adding that driving piles using the RM 20 instead of the conventional way is more cost efficient, even with the price of the rental. It required both physical and mental effort for PKF’s crew. While the piles arrive on site marked with driving depths, they do not always match the supplied borings. It requires the team to choose and manage piles based on how the others are going in to avoid waste. PKF was accustomed to being able to revisit driven piles before splicing because the hammer with leader dangles overhead and can be repositioned. Using a track-mounted machine like the RTG required careful selection of pile sizes and immediate splicing in areas where driven piles were clustered several rows deep. PKF rose to the challenge, proven by the crew’s production rate of up to 20 piles installed per day. The RM 20’s productivity dazzled PKF regardless of whether the piles were plumb or battered. The RM 20 can effectively drive battered piles because of its adjustable leader, which can tilt backward 45 degrees, and forward and sideways 18.5 degrees. The high turning point of the mast provides stability in even the most extreme inclinations. Upon evaluating the positioning of the piers and abutments, in addition to the topography, PKF recognized that positioning the crane at street level to service the pile driving operation presented challenges. The RM 20’s ability to maneuver on the jobsite proved essential. It was not just the RM 20’s confined space functionality, but also its ability to navigate challenging terrain, especially mud. While a crane could have been positioned to avoid the mud altogether, the problem on PA Turnpike/I-95 Interchange Project was that there was often nowhere to position it. Villanti recalled an instance where PKF needed to relocate the pile driving operation to the other side of a bridge with a 13 ½-foot clearance. The operator hydraulically tucked the RM 20’s mast down and crawled underneath. Breaking down and relocating a crane would have been cost-prohibitive. PKF had been using the RG 19 T piling rig with a vibratory hammer in summer 2015 before the RM 20 with an HRS 5 accelerated hydraulic hammer took up a permanent position on the site. The RG 19 T was driving sheeting and soldier piles for non-load bearing applications, but traffic was shifted onto newly constructed facilities in September 2016, prompting the need for a different approach. The HRS 5 delivers up to 53,104 foot-pounds. PKF especially appreciated the ability to adjust the energy going into the hammer with the flick of a thumb. The HRS 5 not only delivers a higher percentage energy transfer than a traditional diesel hammer, it is also faster, delivering 50 to 170 blows per minute. The rate was so rapid that the on-site PennDOT inspector had concerns about being able to keep track of the pile count. Fortunately, the RM 20 records the count, which alleviated that issue. The added power of the RM 20 with HRS 5 facilitated compliance with an aggressive PennDOT specification, which requires 20 blows per inch to refusal on bedrock. PKF was penetrating a silty sand surface, underlain by a tougher layer of saprolite, which varied in depth. PKF drove 14 x 89 H-piles to dense bedrock at 12 to 80 feet, although 35 feet was the average. Piles were capped with a heavy-duty steel tip for added penetration. PKF was driving piles with hammers and leads from 7 a.m. to 10 p.m. Despite its respect for local noise ordinances, Keough admits that some nearby residents expressed concern. “It’s much quieter than any traditional pile driver out there,” says Langan. “There is a noise percussion system built into the hammer to eliminate the ring I call the church bell sound when you hit steel on steel.” The HRS 5 contains a drive cap system, an easily replaceable plastic insert that prevents steel on steel contact. And the opportunity is likely to increase. PKF, once focused only on self-performing its foundation work on its heavy/highway construction projects throughout eastern Pennsylvania, New Jersey, and northern Delaware, will now provide this work as subcontractor. 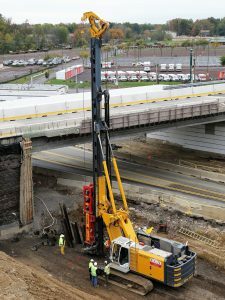 Based on its successful switch on the PA Turnpike/I-95 Interchange Project, the odds look good that the fleet will include RTG Pile Driving Rigs.